UVS is a proud recipient of The President’s "E" Award 2016 for excellence in export of financial services. 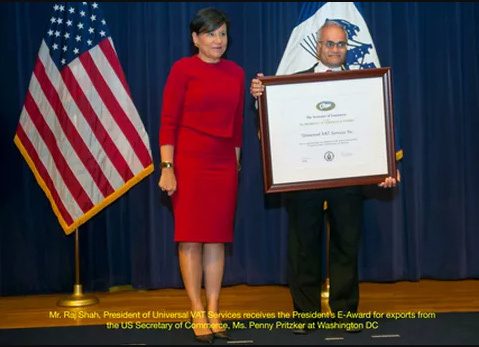 Ms. Penny Pritzker, Secretary of Commerce, in her citation that accompanies the Award, stated, ”Universal VAT Services has demonstrated a sustained commitment to export expansion. The “E” Awards Committee was very impressed with Universal VAT Services’ customization of sales channels for different export markets. The company’s creativity in developing cost-saving models for its international clients was also particularly notable. Universal VAT Services’ achievements have undoubtedly contributed to national export expansion efforts that support the US economy and create American jobs”.